In the pursuit of truly spectacular vintage pieces--at prices that are within real-life budgets--it's usually best to think laterally. For example: a mint-condition 1950s Dior suit rarely comes on the secondhand market for less than thousands of dollars. Ensembles such as these are museum pieces. Given their importance as historical paradigms, compounded by their rarity, the four-figure price is reasonable. Yet one can readily find a smashing Dior hat from the same period, of equal historical import and aesthetic merit, for under $100. Another example. Mikimoto, the Japanese firm that pioneered the culturing of pearls, remains the industry's top practitioner. A vintage string of smallish pearls from the 1960s will fetch a price of $600 or more. But their scarves, which are brilliantly printed and crafted, and to my mind of no lesser value than those of Ferragamo and Gucci (if not quite up to the unsurpassed quality of Hermès), typically sell for under $30 on the rare occasions they come up on eBay. Mikimoto=pearls. Dior=dresses, suits, gowns. Anything that deviates from the house's front-of-the-house products are less covetable to the vast herd of buyers. In no way does it mean that they are less brilliant, or beautiful, or fantastically made. This is also the case, I believe, with the vintage leather bags of Judith Leiber. Since most of us can't make it out to the family's museum and showplace garden in East Hampton, Long Island, here is the quick version of the lady's story. A Hungarian Jew, she diverted from Cambridge University studies in chemistry to become the first female member of Budapest's handbag guild. Evading the Holocaust, she married an artistic Yank soldier who brought her to the States, where she helped fund his printmaking pursuits with a small cottage industry making handbags. The firm went on to become one of the premium luxury-goods manufacturers in America, best known for its minaudières (pronounced minnow-dee-air). 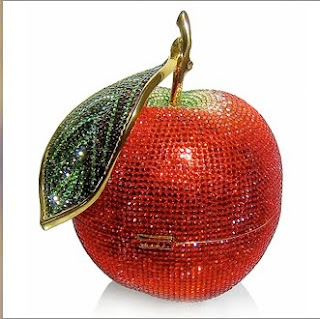 These metal-shell evening bags are encrusted with thousands of crystals, taking the form of glimmering beasts, Buddhas, hand-holdable replicas of famous works on canvas, and countless other bijou incarnations. While jewelboxes like these sell in the thousands even secondhand, the firm's leather bags, which are equally well crafted, rarely meet that same lofty mark, simply because in most buyer's minds, Leiber=crystal, and that's that. 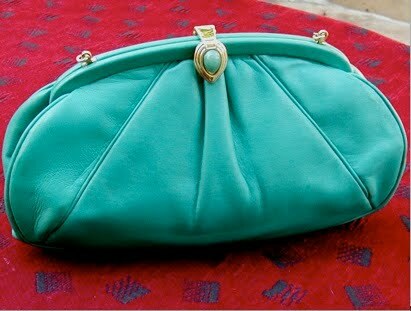 But isn't this Leiber bag, of aqua lambskin, just smashing as well? And its cost, while steep for an everyday purchase, is extraordinarily reasonable given that its style and quality surpass most of what's going for ten times that amount in department stores at the moment. So, this entry is a fairly roundabout way of saying that if you want to find a brilliant buy for well under actual value, think out of the minaudière. More examples with different sorts of items later this week.